← Try the Collins Library search on your mobile device. 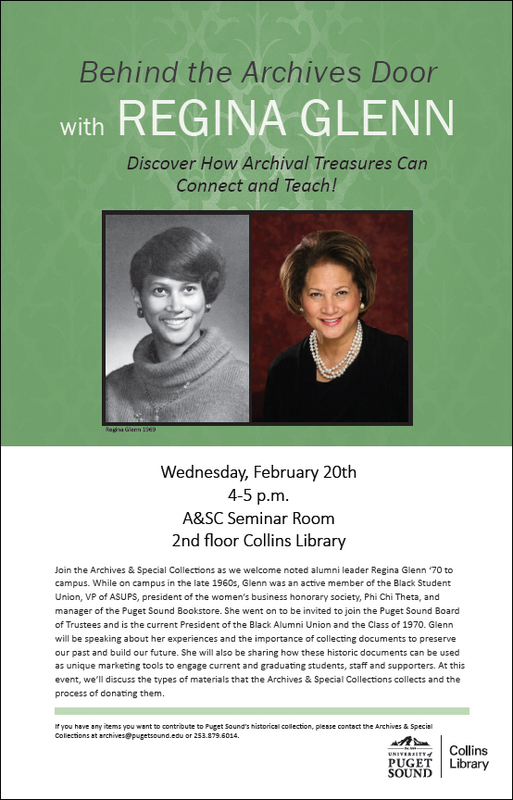 Join the Archives & Special Collections as we welcome noted alumni leader Regina Glenn ‘70 to campus. While on campus in the late 1960s, Glenn was an active member of the Black Student Union, VP of ASUPS, president of the women’s business honorary society, Phi Chi Theta, and manager of the Puget Sound Bookstore. She went on to be invited to join the Puget Sound Board of Trustees and is the current President of the Black Alumni Union and the Class of 1970. Glenn will be speaking about her experiences and the importance of collecting documents to preserve our past and build our future. She will also be sharing how these historic documents can be used as unique marketing tools to engage current and graduating students, staff and supporters. At this event, we’ll discuss the types of materials that the Archives & Special Collections collects and the process of donating them. If you have any items you want to contribute to Puget Sound’s historical collection, please contact the Archives & Special Collections at archives@pugetsound.edu or 253.879.6014.